ONDULINE ZİGANA TILE is absolutely waterproof under all weather conditions. No rust, no mold, no dirt and no need for maintenance. No rust, no dirt, no need for maintenance. ONDULINE ZİGANA TILE is the new member of Onduline Avrasya’s bitumen based corrugated sheet range, which resembles to clay tile by shading of Zigana profile. "Recreate your roof with ZİGANA TILE, the game changing roofing sheet." Enjoy your new roof with ZİGANA TILE instead of rebuilding old, water leaking roofs. Save on cost and time now with Zigana Tile, can be used both for roofing and covering for a long period of time. Waterproof under all climatic conditions. ONDULINE ZİGANA TILE doesn't rust. ONDULINE ZİGANA TILE sheets are composed of bitumen saturated organic fibres combined with a special resin. This unique production method gives an extra mechanical resistance to the sheet structure. 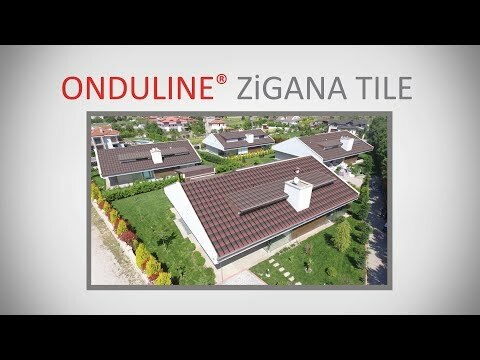 ONDULINE ZİGANA TILE can be used on a wide range of buildings including residential and collective houses, institutional, commercial and industrial buildings. ONDULINE ZİGANA TILE is a lightweight system with only 4 kilograms of weight per square meter, which can be applied on a wide range of lightweight roof structures. A simple toolbox including a hammer and a cutter is enough for the application. Apart from the other roofing materials, ONDULINE ZİGANA TILE sheets can go longer distances without being broken. ONDULINE ZİGANA TILE has stripes to ease installation. ZİGANA TILE has the special stripes on both top and down sides to save time while installing the sheets. It has also ‘’ÜST-TOP’’ embossed stamps on top side of the sheet which guides the direction of installation. Therefore, ZİGANA TILE is very easy to install. ONDULINE ZİGANA TILE sheets are manufactured with "ÜST-TOP" embedded on. This embossment is unique characteristic for ZİGANA TILE sheets which makes it very easy to separate from the imitations as well. ONDULINE ZIGANA TILE system ensures the waterproofing of your roof with a full range of accessories to finish up the roof. A uniform roof is obtained when the accessories are used along with the roofing sheets.